Hi, my name is Andrea and I'm obsessed with my dog. How could I not be - look at this face! I could be having the worst day ever, but when I come in the door and this smiling face is the first thing I see, all those problems just melt away. Joe made one of the best decisions he has ever made when he brought this "little" guy as my Christmas present three years ago. As anyone with a furbaby can attest, I shout my love for this guy from the rooftops. There's a picture on my desk, pictures all over our house, he's my cellphone lock screen, and when we left him at Joe's parents while we were on our honeymoon and they sent us a video of him, I cried. When Kimberly from Nair & Bjorn approached us about featuring her shop on Bookish Lifestyle I jumped at the chance. 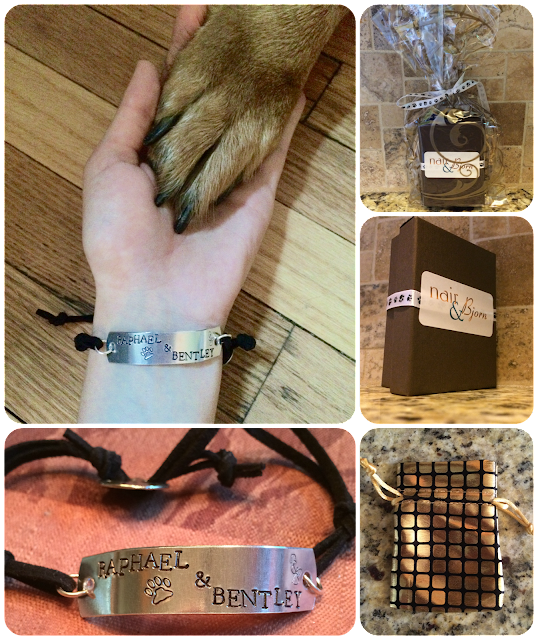 Aside from featuring handmade jewelry, some of which has been worn by celebrities and seen on television shows (most recently The Vampire Diaries, Bones, and Veep), Kimberly donates 10% of her proceeds to no-kill shelters. 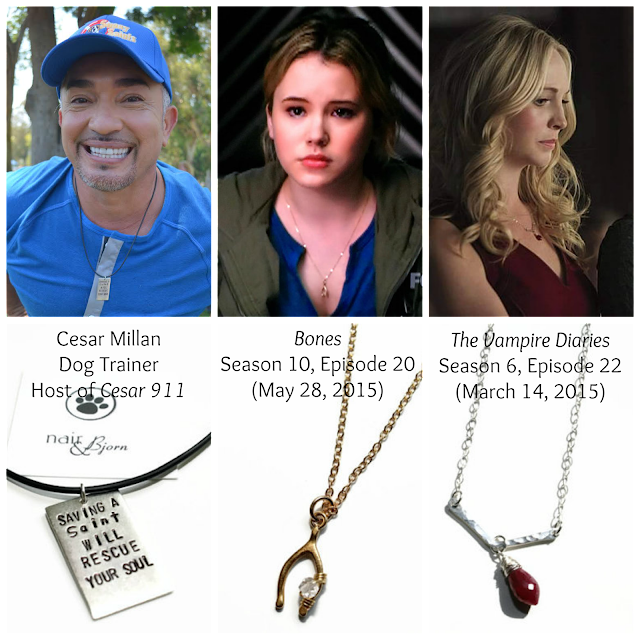 Even Cesar Millan, dog trainer and host of Cesar 911 on the Nat Geo WILD, has worn one of Kimberly's designs! Our rescue Mowgli, was a stray we found while walking our dog, Nemo on Valentine's Day 5 years ago. He had no tag on him so we put in ad in the local paper and flyers around our neighborhood. Nobody claimed him, so we kept him. He became the inspiration for my business and is a cancer survivor. He has been in remission for a little over 2 years now. Our other dog is a rescue named Nick we adopted from one of the rescues I work with named Barks of Love. A few months after our dog Nemo passed away, we offered to foster Nick so he could be pulled from a kill shelter one day before he was scheduled to be euthanized. Barks of Love named him Nick since he was saved in the "nick" of time. We adopted him a few months after fostering him. We have had him almost 3 years now. As somebody who has to quickly change the channel when those Sara McLachlan commercials come on, I can attest to the need shelters have for funds and love the Kimberly is doing what she can to help, both in donating a portion of her proceeds and adopting rescues. I myself have received one of Kimberly's own design. She has an wonderful array of what she refers to as "rescuewear," pieces of jewelry stating your love for the four legged loves of your life, among a variety of necklaces and earrings. Eventually I decided on the Custom ID Pet Name Bracelet. I just could not decide whether to have my ID bracelet say Raphael or Bentley (Joe said Bentley, but he's rather partial). I asked Kimberly if she'd be able to do both names with the paw print and she said it'd be no problem. I was thrilled when the bracelet came in the mail and I absolutely love it. All of Nair & Bjorn's items come in their signature packaging, so if you planned on giving it as a gift, you're all set! The aluminum tag itself is polished and is approximately 3/8" x 2" with the names hand-stamped. I can imagine some people may get eye-twitchy because the letters don't line up, but I love that the placement of the letter give this item the definite feel of homemade / made for you rather than a mass produced one. In my mind, when ordering from small businesses it's the little things that make it unique and special. The adjustable faux suede cord includes a small buckle in the back that allows you to easily adjust the size. Once tightened the straps are a bit on the long side (though they have to be in order to get the bracelet on and off), but I just wrap it around the cord a few times and it's no big deal. The cord comes in six colors, allowing for even more customization. And if you're a fan of sparkle, you can replace an "O" with a matching Swarovski crystal. I love that with this one bracelet I am able to keep both my special boys close to me. I had a rough day at work the other day and at one point glanced at my bracelet and couldn't help but smile. Just looking at these two names made the craziness a bit easier to deal with. This bracelet, along with Nair & Bjorn's other products - are perfect gifts for any animal lover in your life or for yourself! Kimberly has very generously decided to give one Bookish Lifestyle reader $100 to her shop on Etsy. This is a giveaway you don't want to pass up. Stock up on gifts for the animal lovers in your life (it's never too early to shop for the holidays!) and get yourself a little something as well. Trust me, if you don't get something for yourself, you're going to be so jealous! Besides, you know you have your eye on something from Nair & Bjorn - don't lie.